Following the release of the new LCR-Reader, a lighter and more cost effective model in the Smart Tweezers LCR-meter line, Siborg has decided to start phasing out production of the ST5L model, the “budget” model of Smart Tweezers. The LCR-Reader is in the final stages before production, with small changes being made to the mold, packaging and PCB, the device has an intended release date of July 1st, 2013.
fig 1. 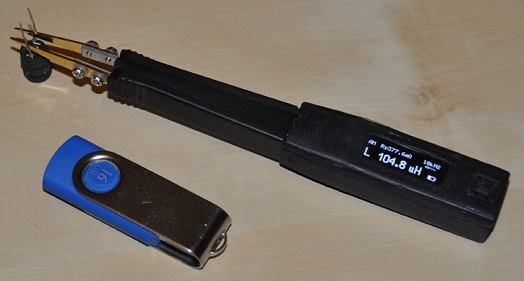 The new LCR-Reader from Siborg Systems Inc.
Like Smart Tweezers, the LCR-Reader has a fully automatic mode, where the device automatically determines what type of component is under evaluation and measures respectively. indicates that the device is measuring in Automatic Mode, the parasitics are also accounted for, displayed here with Rs, 10kHz is the test frequency being used. 108.4 uH is the main impedance value. 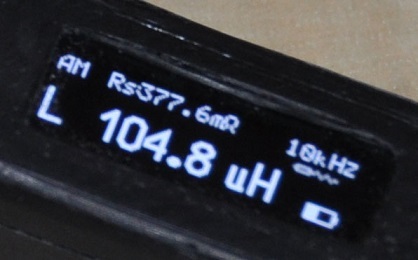 A small battery icon shows the remaining charge of the Li-Ion battery. A short video introduction of the new LCR-Reader is available on youtube. Pre-Order today here to get a 20% discount. The Smart Tweezers Comparison Table has been updated with the new LCR-Reader to compare features on the new device and previous models.